Canine eczema can be just as sore and irritating for your dog as any of the types of eczema are for humans. It is also known as acute moist dermatitis, atopic dermatitis and canine hot spots. It can occur on any part of your dog's body. It mainly affects the face or the underside of the body. If your dog is carrying some extra weight then it may appear anywhere there are folds of skin. It is more likely to affect dogs in the summer. Especially in long coated breeds, and in dogs that enjoy being outdoors a lot. 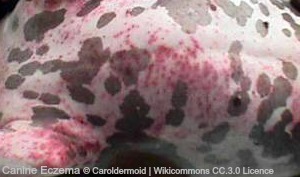 If your dog has eczema then there maybe some skin damage from any scratching and biting. If you notice any of the above symptoms, go and see your vet. The quicker treatment can be started the better. It can help to reduce the risk of a bacterial infection, which can enter the skin through breaks in the skin. If allergens or irritants are a cause, then you can try and limit the contact that your dog has with the offender. This is easier to do if you know what is causing the problem. But it isn't always the case. This may help to narrow down what is affecting the skin. Your dog could be affected by anything that could affect a human with eczema. You can read more about some triggers of eczema, including weather and stress. If keeping a diary doesn’t reveal anything, the next step could be to have an allergy test done. This will help to confirm any allergies or intolerances. 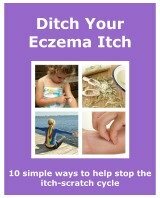 You can read more about natural eczema treatments here. Just always check with your vet before using them. If your dog has canine eczema you will know that it can be quite severe and distressing. If you can work out what is causing the flare ups and use the right treatments and precautions, it should clear up in time. Always get professional advice from your vet. They will be able to diagnosis the condition. Then provide treatments and advice to help you to help your dog and their skin.